Carnauba wax is sometimes also called palm wax or Brazil wax. Our Clear Carnauba Paste wax is very easy to use. You simply clean the area that you will be applying it of all oils or other waxes. This cleaning is easily done by using mineral spirits or even a paint thinner. Then you apply with a clean cloth a thin coat evenly of the Carnauba wax. Allow the Carnauba wax to dry thoroughly. You then buff the surface area with a clean cloth until you have an even sheen. You may have to apply a second coat and buff again. Carnauba Paste Wax is not recommended for use with unsealed or raw milk paints. The surface should be sealed with Pure Tung Oil or other suitable finish. Clear Carnauba Wax is an inexpensive paste wax for large surfaces. This wax is also a great hard drying paste wax for furniture and wood surfaces. Carnauba wav provides protection and a rich, satin luster to a finished surface. 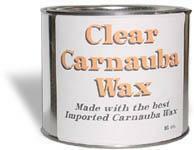 Our Carbauba wax is formulated with imported carnauba wax for added hardness and surface protection. Caution: - Combustible Mixture. - Do not expose to open flame. Keep away from children.. - Please call or email if you require the Material Safety Data Sheet for this product. - We can not guarantee that individuals with compromised immune systems or allergies will not have a reaction to our products. We strongly recommend that each person take their own personal responsibility in testing this product for their own personal use.